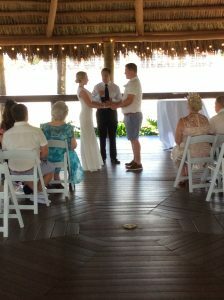 Howard and Rachel traveled from Great Britain to the gorgeous Sunset Key Island featured by Westgate Resorts in Orlando. Lon Tosi from Sensational Ceremonies conducted a custom wedding ceremony for the couple that they totally created by themselves. It was a unique ceremony conducted in front a very small group of friends and family. Sunset Key Island is in the middle of Little Sand Lake just outside of Orlando, and features pristine water views and of course a gorgeous sunset each evening! Rhodes Studios captured the entire event photographically. Flowers by Leslie provided the floral. Sensational Ceremonies provided the music, and Married By Mail made certain that the couple had their Florida Marriage License. The ceremony featured a description of marriage that including the thought that marriage is made up of a few major moments surrounded by many little moments that actually give a relationship a true meaning and depth. What a great concept! We wish you well Howard and Rachel. By the way, Howard is a mail man in England and felt comfortable in in casual attire, which was perfect for the warm Orlando climate! The couple intends to visit the local parks including Walt Disney World, Universal Studios, Orlando, and Sea World, Orlando.